Melt half the oil and butter in a large, deep, lidded non-stick frying pan. Fry the thighs for 6-7 minutes in the pan, until browned all over. Using a slotted spoon, remove the chicken and reserve. Place the remaining oil and butter in the pan, add the onions, garlic and honey and fry on a high heat for 1-2 minutes, stirring, then reduce the heat slightly, cover and cook for 5 minutes, or until the onion has softened. Remove the lid and increase the heat to high. When the onion has browned, sprinkle in the flour and stir well. Gradually pour in the wine and bring to the boil, stirring, until thickened and blended. Return the chicken to the pan with the mushrooms and bring back to the boil. At this stage, the casserole will be rather thick. 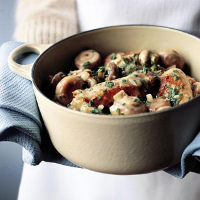 Cover, reduce the heat and simmer for about 35 minutes, stirring occasionally, until the chicken is tender and thoroughly cooked and the sauce has thinned down with the juices from the mushrooms. Stir in the crème fraîche, season to taste and stir in half the tarragon. Serve garnished with the remaining tarragon. Make the whole dish omitting the crème fraîche and tarragon. Allow to cool then freeze in an airtight container for up to 1 month. Thaw overnight in the fridge, then reheat on the hob, stirring gently. Bring to the boil and simmer until piping hot. Add the crème fraîche and tarragon, as in Step 4.